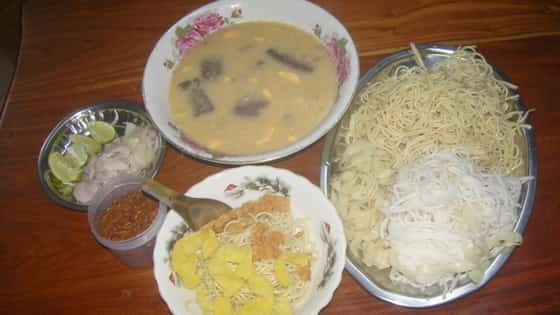 The tasty Burmese traditional coconut Khow Suey has lots of benefits but it also has many disadvantages for some people. The rich flavor and creamy consistency of coconut-milk is considered to be a healthy product but there are some side-effects. Since coconut khow suey is make of coconut milk, it also contain some health risk of coconut. Therefore, along with its benefits, there are some health risk of coconut Khow Suey you need to know about. Too much coconut milk can give the risk of high cholesterol and cardiovascular diseases. Since it can give the risk of heart problems and stroke, it is not suitable for the people with heart-disease. But if you only eat smaller servings, you won’t get high side-effect. However, doctors won’t recommend the patients with health problem and hypertension to eat coconut khow suey. Khow Suey can cause digestive problem due to high dietary fibers from coconut milk. Too much khow suey can cause constipation or gas. It is not a big problem for healthy people, but can lead to constipation for the people with weak stomach. Coconut milk contain too much sugar, therefore coconut know suey also have high amount of sugar. People with Diabetes should not eat coconut khow suey because it contains 21 gram of sugar in one serving. Therefore, it is better to abandon coconut know suey if you have diabetes. Since it contains too much sugar, it is obvious that eating coconut milk can give you high amount of calories. One serving of coconut khow suey has around 600 calories. Too much calories can give you negative side-effect on your health, therefore too much coconut khow suey is a “no”. Coconut Khow Suey is an enemy of the people who are trying to lose weight. Since there are high amount of calories and too much sugar, this khow suey is a dangerous diet for over-weight people. If you are planning to run for about 3 hours after khow-suey, you won’t need to worry about weight-gain. If you are allergic to tree nuts, you should not eat coconut khow-suey because coconut is one of the tree-nuts. It is dangerous if a person who has allergies to tree nuts consumes coconut khow suey. This can be life threatening in extreme cases. 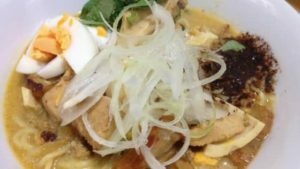 After reading this post, you may afraid to try Khow Suey, but if you are healthy person, you don’t need to worry about health risk of coconut. These problems only happens to the person with hypertension, stomach problem and diabetes person. And there is an alternative way to make Burmese traditional Khow Suey without using coconut milk. You can read this post to get more clear idea how to make Khow Suey more healthy.